Did Christmas cause the riots? 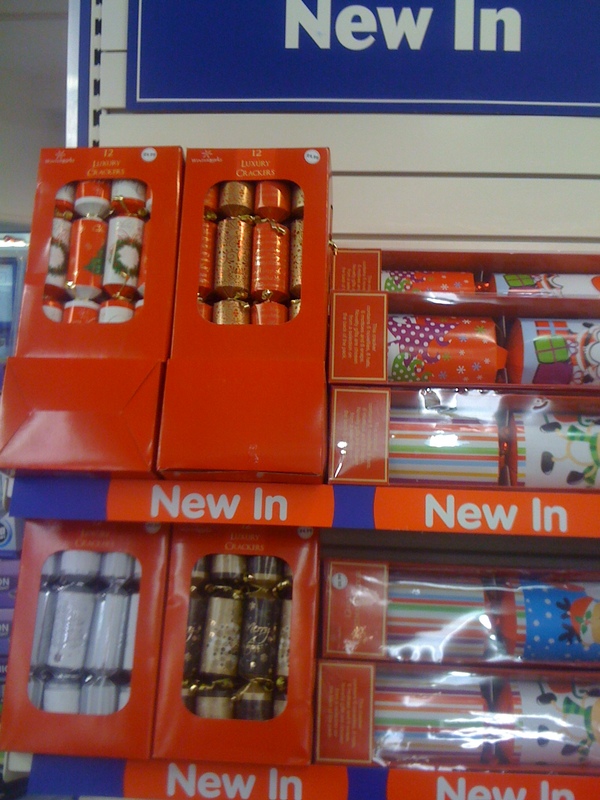 I spotted these Christmas crackers on sale in our local town centre yesterday. I posted the pic on Facebook yesterday and one friend commented that Selfridges has had Christmas decorations on sale for weeks already. There were other comments expressing dismay and outrage. I find this unseasonal selling particularly ironic and cynical when so much Xmas imagery focuses on the fact that it happens in winter – even in parts of the world where it doesn’t. Snow, robins, holly berries, mistletoe…they all seem to be at least as prominent as Jesus. It is depressing; the sense that every year a little bit more of the “true spirit of Christmas” – whatever that means to you – is annihilated by rampant commercialism, typified for me by this. One can’t help feeling that the only reason that Christmas is still such a major festival in this country is because of the intense energy retailers and other businesses put into building it up and stretching it out. If it didn’t traditionally involve the giving of presents, it probably would have fallen into semi-obscurity by now. And isn’t one of the causes cited for the recent public disorder and violence in this country the excessive commercialisation of society? One by-product of mass materialism is a loss of perspective about what really matters in life; an erosion of human values which is dehumanising in a very real sense. The truth is, we live our lives in the throes of systematic and sustained psychological manipulation by multifarious commercial interests, supported by and influencing the media, and using things that are important to us like status, beauty, security, nostalgia, family, etc. to make us buy stuff. It’s fatuous to say that doesn’t have an effect on us. Most of us simultaneously outwardly repel and inwardly succumb to the hype. We may feel dismayed that Christmas starts in August and seems to be all about profit, but we will quite possibly still spend hundreds of pounds on presents and paraphernalia between now and December 25th, even if we’re not Christian. If you follow where this line of tension (between knowing you’re being manipulated and still letting it happen) ultimately leads, you end up with people smashing, looting and burning the premises that sell the stuff they are constantly pressurised to want. The “OMG I can’t believe that!” comments on my Facebook post are one end of spectrum; smashing, grabbing, destroying and releasing pent up fury in an animal frenzy of excitement and adrenalin are the other. Same spectrum though. But contained within this steaming morass of factors are two conflicting elements. On the one hand there’s poverty of opportunity; on the other the commercialisation of society. Ultimately retailers flog Christmas in August in order to stimulate spending and make more money, which should create more general wealth and opportunities. If nothing else, it certainly creates a load of temporary ‘Christmas jobs’. So I suppose that makes it a good thing in some ways too, doesn’t it? Maybe the counterbalance to looting is buying stuff. So I guess what I seem to be driving at is that the correct response to Cameron et al’s riot response strategy might be “Crackers”.